In The Cast Member Diaries Part One: From Guest to Cast Member, I detailed the epic saga of how I applied for–and ultimately got–a job at Walt Disney World. When we left our stalwart hero (that’d be me, folks) at the end of that post, I had just completed my training and was now working at the Disney/MGM Studios as a part-time cast member. So what did I actually do as an employee of “The Mouse”? Each day pretty much started out the same, regardless of which attraction I was scheduled to work: I drove the roughly forty-five minutes from home to work, and parked in a little employee lot behind the Disney/MGM Studios park. I would swipe my ID card in a machine at the security station to indicate that I was now on shift, and then I would head to costume pick-up. They had all of my sizes on file in their computers, so I would show them my ID and tell them where I was working and they would go back into this massive room of clothes and return with what I needed. If I was working at the Magic of Disney Animation, I’d be in grey slacks and a long sleeved striped dress shirt with a tie. If I was scheduled at Voyage of the Little Mermaid, I’d be in a very sailor-like navy and white striped shirt and white pants. On very rare occasions I would get to wear something else: I covered a shift at Tower of Terror once and got to wear their bellhop gear (which wasn’t without its misadventure), and if I was working on Parade Audience Control–more on that in a bit–I’d sometimes change into khaki pants and a short sleeved yellow shirt for a couple hours. At the end of the day, I’d return my outfit to this same area. Once I had my outfit in hand I went to the locker room and got changed, put my street clothes away, and then headed out to my attraction. The Studios doesn’t have Utilidors like Magic Kingdom, so I’d navigate backstage areas to get to the Animation Courtyard area. I’ve forgotten some of the little details in the decades since then, but I’d assume that I had to check in with a supervisor to let them know that I was there before I jumped into the rotation. My “main” attraction, the first one that I was trained in and the one that I worked the most, was The Magic of Disney Animation. At that time it was a sort of self-guided tour through a working animation studio. Guests started in the front lobby, surrounded by cels and maquettes. Once the theater doors opened, guests were ushered into the theater where they watched a short movie (starring Robin Williams and Walter Cronkite) about the animation process. Upon leaving the theater they were in the studio area. Guests stood on an upper level of sorts and, separated by soundproofed glass panels, they were able to watch animators at work. There were also video screens located around the room, on which Walter Cronkite and Robin Williams explained different aspects of the animation process. Guests could stay here as long as they wanted and watch the animators, who were working on actual Disney animated features. Further down on the tour were colorists, and you could watch them paint cels for sale in the park’s shops (as by this point in time the coloration of the films was done on computer). The tour ended with another short film, a collection of clips from Disney animated features. There were several cast member positions throughout the attraction. At the front entrance was a greeter, who invited guests inside and answered questions about what the attraction was all about (in addition to fielding other queries, like where to find other attractions/restrooms/food or what time the three-o’clock parade was happening that day). In the front lobby was a second cast member, talking to guests about animation and pointing out the cels and maquettes while waiting for the theater doors to open. There was a basic spiel for this, but we were given a fair amount of wiggle room as well as enough time to answer guests’ questions. In the first theater was another cast member with a microphone who would direct guests to seats and tell them what they were about to see. At the end of the film they would also direct guests to the doors that led to the studio section. The next cast member was there, and their task was primarily being available to answer questions. There was a short spiel that we’d say when a group first came into the studio area, but then we would wander and be available to guests as needed. There may have been a cast member in the lobby area for the next theater, preparing guests to go inside, though I honestly can’t remember if that was actually a thing or not. I know there was a cast member in that last theater who, like for the previous film, mostly ushered guests into the seats and then ushered them out when the movie ended. Cast members would rotate between these positions, starting as the greeter and then moving to the next one every fifteen minutes. After the second theater you’d go on break, then hop back into the rotation at the greeter position and repeat the process. This was a great system, as it meant that you didn’t really get stagnant in one spot. Also, you weren’t stuck outside on a hot day for too long. The Magic of Disney Animation was a little different than most other attractions, as it was mostly self-guided. Cast members were there to direct people and answer questions, and we had our spiels, but for the most part guests could wander around and spend as much or as little time watching the animators as they wanted. They were free to skip the second movie, and even the first if they just wanted to come back and see the studio. Plus, the animators worked on a different schedule than we did, so usually at five o’clock they went home. At that point we were pretty much just showing guests the empty desks where the animators worked. You could still see the studio, but that was obviously a bit less exciting than watching someone actually drawing. This was when we’d sometimes encounter long stretches of quiet time. We’d still get a steady trickle of guests, but not nearly as many as the more popular attractions. Though we were sometimes a quiet haven late in the evening for families with children who were scared of fireworks. The attraction really highlighted what the park was all about back then: giving guests a behind-the-scenes look at how movies were made. Over the course of my time there I learned a bit about the animation process, too, which helped me answer questions. One time, I was down in the animation studio at the end of the day (we were tasked with shutting off the lights) and there was one lone animator working late. We started chatting for a bit–she welcomed the distraction after sitting alone lost in her work for hours–and she showed what she was drawing, which happened to be art for Mulan. I never personally met any of the colorists, but we often waved and smiled to each other as I walked by. Pocahontas came out that year, and I got to attend a special screening at the park a few days before it was released to theaters. The whole experience of working there was amazing. 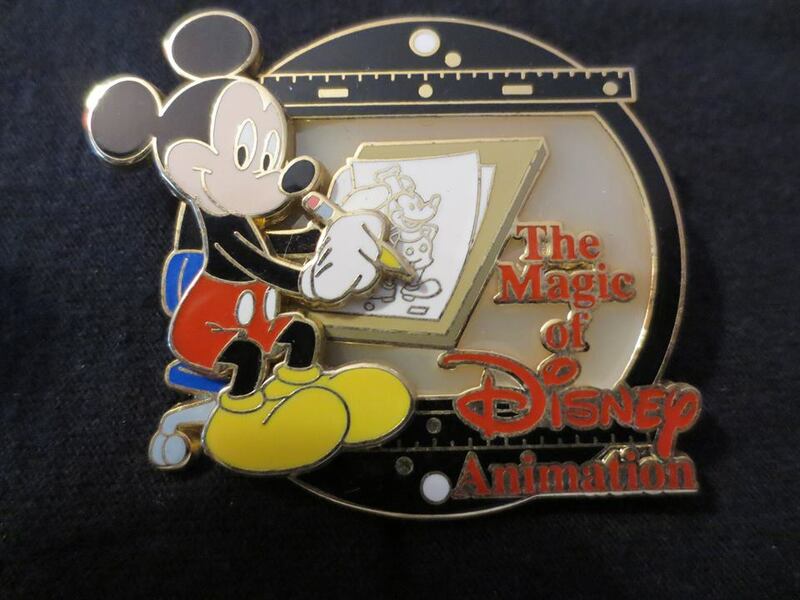 I bought this pin, years later, as a reminder of my time working at the Magic of Disney Animation. At Voyage of the Little Mermaid, I was part of the team responsible for greeting guests, ushering them into the theater, and reminding them to move all the way down the aisles and to not use flash photography. Like the Magic of Disney Animation, there were several positions which we rotated between throughout the day. There was generally a greeter outside, and another at the turnstiles who would keep an eye on the number of guests coming into the queue area (to ensure that we didn’t go over the theatre’s capacity). Another cast member stood at the doors, chatting with guests while they waited to be let in. When the doors opened, guests were ushered into a foyer area decorated with a nautical theme, where a cast member with a microphone stated that the doors to the theatre would open momentarily and asked that guests move all the way down the aisles. In the theatre, a cast member reiterated the aisle thing (often multiple times) and then requested that guests not use flash photography. This cast member stayed in the theatre throughout the show, with a flashlight, to assist guests as needed and also to stop those who ignored that request. When the show was completed, that cast member got back on the mic and directed guests to the exit. Needless to say, I’ve seen the Voyage of the Little Mermaid show a lot. We ran shows every forty-five minutes (thirty minutes on really busy days) and over the summer we often filled the theatre to its 400-person capacity with every show, so working Voyage of the Little Mermaid was generally a much more hectic experience than the relaxed pace of the Magic of Disney Animation. Once, we tried to keep track of how many guests came to the show over the course of a day, and finally estimated it at a little over ten thousand. It was this attraction, too, where I really learned the ropes of being a Disney cast member. Animation, despite its not-very-straightforward style, was actually pretty straightforward. Guests came through because they wanted to see animators work, they would do that for a bit and maybe ask a few questions, and that was pretty much it. I never had any negative interactions with anybody, and in fact once got commended by my supervisor for knowing my stuff and teaching a sort of impromptu “class” to a group of guests after someone asked me a question. At Mermaid, though, we were trying to get people in and out of that theatre as efficiently as possible. This lent itself to a different pace, and different situations. Not that working Mermaid always meant running at a crazy pace. One night, some huge national construction company “rented out” the park. They had a big convention on property or something, so after we closed for the evening (we may have actually closed a bit earlier than normal, I can’t recall exactly) we remained open for their employees and families. Not every attraction was open for this, but Mermaid was. We only ran a few shows throughout the evening, everybody was relaxed and the guests–since they were representing this company–were all on their best behavior. It was a fun night. 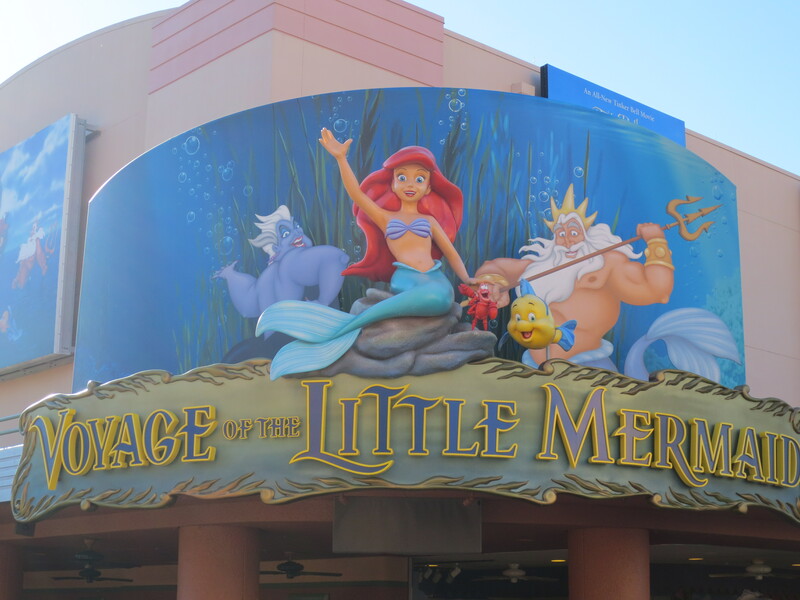 To this day, when I walk by Voyage of the Little Mermaid I briefly pause and realize that I worked there. It seems like a really long time ago (probably because it was). Sometimes, I’d get the chance to be on the Parade Audience Control (PAC) team. Every day they’d grab a handful of volunteers from the attractions throughout the park and ask them to assist in operations for the daily parade. Mainly, we’d set up the stanchions and ropes before the parade and take them down after, and keep guests from walking across the parade route. I volunteered for it a lot, as I found it a lot of fun and it was neat to get something different to do during the day. Plus, on really hot summer days, we’d often get popsicles at the end of the parade to cool us down before heading back to our respective attractions. I like popsicles. One other attraction that I sometimes worked at was the Making of the Lion King. This was a walking tour, with a few post-processing facilities behind soundproofed glass. The cast member would usher a group of guests in so they could stand and look at the facility and explain what happened there, then move on to the next one. Sometimes there’d be people working, which was slightly more exciting than showing the guests empty rooms. After taking the guests through the tour, we’d bring them into a theater where they’d watch a movie about the making of Lion King, with behind-the-scenes footage and interviews with the voice actors. The movie was pretty interesting, there was a section about the animators observing real lion cubs and an interview with James Earl Jones (who likened voicing animation to Greek thespians performing behind masks), but overall I found working at this attraction sort of boring. Fortunately I didn’t end up there a lot, and was usually stationed at Animation or Mermaid instead. I covered a shift at Tower of Terror once. It was only for the day, and since I didn’t know the flow of the attraction I was primarily stationed as a greeter. I detailed that misadventure in a previous post, which you can find here. It wasn’t all work all the time as a Walt Disney World cast member. There was the time I got to see the Extra TERRORestrial Alien Encounter attractions before it was opened to the public. We all lined up in the Utilidor underneath the attraction (so guests didn’t see a crowd and think that it was open) and then filed up in groups to see it. It wasn’t the most amazing attraction ever, but it was cool to check it out with some friends and be part of the special cast member preview. Then there was the fact that I had an ID, which allowed me free entry into the parks. One time, a fellow cast member and I got off shift at the same time and decided that we wanted to go on Pirates of the Caribbean. So we hopped on a bus to Magic Kingdom, went on the ride, and then headed back to the Disney/MGM Studios so we could get our cars and go home. I didn’t use this free entry a lot, if I wasn’t at work I generally wasn’t at the parks, but there were instances in which I hopped over to a different park and went on various attractions simply because I was already there and I could. The friend that I had applied with worked as a character, meaning that she was in costume doing meet-and-greets. She played a variety of characters–Roger Rabbit, Chip, Dale, Pooh, etc–and occasionally we’d cross paths and give each other a high five. During this timeframe, the Studios parade had a big Abu elephant float (from Aladdin) and she’d sometimes be sitting inside and waving his tail back and forth. One time, when I was on PAC duty, she saw me and told me later that she waved Abu’s tail at me. There was also the day that we were doing an “ice cream social”, which meant that cast members could go to a particular area on break and supervisors were scooping out bowls of ice cream for us to sit and eat at backstage tables. Roger Rabbit happened by, and attempted to make off with my bowl of ice cream. My friend did come back once she was out of costume, and I did share (apparently she didn’t want her own ice cream, she just wanted spoonfuls of mine). I’m probably one of the few people in the world who can say that Roger Rabbit tried to steal my ice cream. Also, there’s something there’s just very Disney cast member about walking to your attraction and giving Winnie the Pooh a high five as you pass by. My fellow cast members were, for the most part, great to work with–there was a real camaraderie that developed among some of us and we genuinely enjoyed working together. I had tons of pleasant guest interactions, and occasionally would remember being a kid and seeing these happy cast members and then realize that now I was that happy cast member to some other child. It wasn’t all happiness and pixie dust, though. It could get extremely hot–that summer we regularly had temps up around one hundred degrees. Often in the afternoon it would get so humid that we’d have a heavy thunderstorm for about a half hour, then the sun would come back out and it would get even more humid. Once, a guest called me some pretty obscene names because I wouldn’t let him sneak into a show that was at capacity. I would sometimes come home tired and grumpy, and one time I didn’t take care of myself and ended up with a touch of heat exhaustion. There was also the fact that Disney has very exacting standards, and meeting those was sometimes a challenge. I once showed up for work with a bit too much stubble, and a supervisor insisted that I shave before starting my shift. I had to purchase a disposable razor from a vending machine and quickly clean up (that’s when I learned that disposable vending machine razors are a terrible and painful invention, and I took extra care to be clean shaven before going into work after that). One time, I was trying to explain to a woman why I couldn’t let her duck under the ropes to get into the Mermaid queue, and that she should walk around to the turnstiles to enter. Unfortunately, she spoke virtually no English, so she had no idea what I was trying to say and I couldn’t follow what she was trying to tell me. The ‘conversation’ went around in circles for a while before she walked away upset. Later that day I received a black mark (I don’t recall what the actual term was) on my record, as she had gone to guest service extremely upset. Essentially her family was already in the queue and she was trying to meet up with them, and I was so set in the “everybody needs to be counted” mindset that I didn’t stop to consider that there could have been better ways to handle the situation. I could have let her in and asked another cast member to spin the turnstile once to count her in. I could have checked to see if any other nearby cast member spoke this guest’s language to facilitate communications. I don’t recall my feelings on the matter at the time (I was about twenty years old) but in hindsight I’ve realized how much that particular moment–and just adhering to the Walt Disney World way of life in general–has positively affected how I’ve worked in customer service ever since. Disney is huge, and an insane number of guests pass through the parks every day, but sometimes it could also be a very small world after all. One day, I was working at Voyage of the Little Mermaid, and I was at the doors that led into the foyer. There was a full house waiting to go inside, and I was making small talk with the guests towards the front of the crowd. A pair of young men noticed my nametag, and the fact that I had put my ‘hometown’ as Ashland, Massachusetts (where I grew up) and asked if I knew a particular person–who it so happens I had graduated with. It turns out that they went to college with him, and we talked a bit about him and they promised to say hello to him for me when they got back home. It was moments like that that made me really love being a part of the Disney magic, and made me realize that the cast member from my audition (see Part One) was right–not smiling would have been exceptionally difficult. In fact, though I never did get to see that cast member again, if I had I definitely would have thanked him for assigning me to the Animation Courtyard. Whether it was helping a confused guest locate an attraction, setting up for a parade, getting guests in to see Little Mermaid come to life, or see people excited to watch animators at work, I was a part of creating a pixie dust-filled experience for people from around the world. It was fun and exhausting, exciting and stressful, magical and (at times) overwhelming, but working at Walt Disney World was simply one of the most amazing experiences of my life. Even now, over twenty years later, I still talk about it and proudly call myself a former cast member. Unfortunately, just like all good things, it couldn’t last forever. Check out the third and final part of the Cast Member Diaries, in which I talk about leaving the Most Magical Place on Earth.